Bo Dietrick, an Orr alumnus who majored in film and business, talks about his career path through Orr to where he is today. Bo has worked for ExactTarget, Salesforce, TrendyMinds and Think Ahead Studios, and now works with his father in the family business, Robert Dietrick Company. 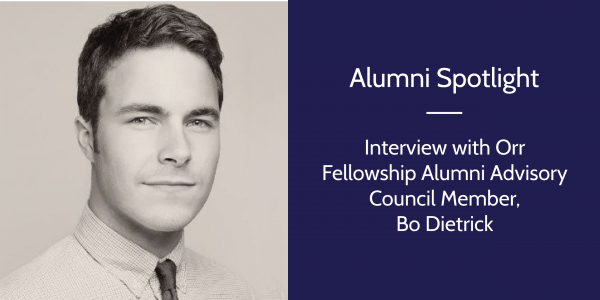 On top of all of his business experience, Bo also shares his insight on film, audio, and what it’s like to be an alumnus on the Orr Fellowship Alumni Advisory Council.